Welcome to another post in our Brommapojkarna series! We’ve already seen how BP performed in the 2025 season, so let’s now take a look at our Academy players and how they have progressed in the 2025 season. If you missed the previous post about our academy players, go back and check it out here. Before starting this episode I want to tell you that I’m continuing to make changes to these episodes. Previously I’ve covered players up to the age of 21 and called the 21 year-olds our “Graduation class”, when they’ve actually already left the U19s and the Academy two years earlier at age 19. Since then they’ve either been good enough to secure a place in our first team squad or spent their time away on loan. My feeling is that the players who haven’t been good enough for us at age 19 rarely are good enough at the age of 21. Therefore players will be graduating at the age of 19 from now on. I’ll keep fewer players between the ages of 19 and 21 in the club if they’re not good enough for us. Instead I’ll try to sell them away, primarily to Swedish clubs in line with our “National Development Program” mentioned in the 2025 Season Summary. I will also mean a change to our transfer policy, where I pretty much won’t be signing any players for our first team. I’ll basically only scout and sign players for the Academy, aged 17 or younger. I will make exceptions if a fantastic player aged 21 or younger falls in my lap, like the case with our new Uruguayan keeper Pintos. I won’t be actively searching for them though. By doing this, my aim is to be able to present a starting eleven consisting of only Academy products in the future! Graduation class – Players that turned 19 years old during the year and therefore will leave the Academy. Who will be promoted to the first team and who will be sold? Notable former Academy players – Academy Alumni now making their way towards the top of European football. Before we get into the new players, let’s take a look at how we performed in the Youth Champions League! We managed to beat Valencia in the 2nd round before being knocked out by Spanish giants Real Madrid in a really tough game. Young Swede Markus Olsson scored in both games from his central midfield position. I sure hope that he’ll keep progressing in coming years! All in all a good cup run for us and a nice experience to play the best European U19s out there! We are not too far behind and I hope we can make it even further in the 2025/26 cup! We really looked brilliant in the group stage, especially in the second half where we smashed some quality teams! We finished top of our group with quite the margin and I’m really excited going into the knockout stage next year, where I hope we’ll reach the semi final! A poor youth intake saw Arsenijevic as the only player deemed good enough for the Academy. We continued to fill up the Academy with players from other clubs, but we are now only focusing on U17s (arrival on 18th birthday for Non-EU players). From this bunch Belgian defender Vandenbulcke is the standout signing together with Brazilian duo Murilo Barroso and Leandro Mathias. Comment: Decent midfielder with a nice First Touch, lacking in both Perception and Movement though. Prediction: Quite far away from the first team squad. Will need to improve everything by quite a lot to compete in the long run. Comment: A right winger with some nice speed. Sadly lacking in many other areas. Prediction: He will need massive amounts of improvement in order to get a chance at the MR position in the first team. Comment: A well-rounded striker who could use some work on his Movement. No real strengths either. Made one appearance for the first team this season. 3 U21 caps for Denmark. Prediction: Will certainly need to improve a bit of everything, particularly his Movement. Perhaps an increase in Determination could help him progress in coming years. Comment: Came in at age 16. A fantastic passer of the ball with nice height! Needs to improve his Movement to play central midfielder. Prediction: He sure has some nice Passing skills to build on. With his height he has the potential to become a midfield monster! Comment: A hard working right back with a lot of speed. Came in at the age of 16 for quite a hefty fee. Prediction: We are a bit lacking in the RB position, so I’m really hoping that he’ll progress nicely in coming years in order to compete for a spot in the first team. Comment: Came in at age 16. A tall striker with nice Finishing. Lacking a bit of Movement as well as some mental attributes. Prediction: Needs to improve his Heading in order to use his height to his advantage. With a Resolute personality he’ll hopefully progress nicely in coming years to challenge for a first team spot in the long run. Comment: The only player good enough to make it through this year’s intake. Amazing First touch and Passing! His unambitious personality must be taken care of straight away. Since he joined us he has made his debut for his 2nd country Serbia’s U21 team. Prediction: Shows a lot of promise with a nice passing game. If we can change his personality he may very well be playing with Lip in the first team in a couple of years! Comment: Joined us at age 16. Looks like a clever midfielder with some nice technical attributes. Lacking a bit of quickness and some mentals. Prediction: Shows a lot of promise at a young age. If he keeps progressing I can see him as a future first team player for us. Comment: A defensively strong central defender. Will need to work on his technical ability. Prediction: Strong and fast with nice defensive stats. If he continues to progress nicely he may not be too far away from first team football. Comment: A central defender with mostly defensive strengths. Spent part of this season on loan at Allsvenskan team Örebro, playing 8 games with an average rating of 6.71. 5 U21 caps for Norway. Prediction: Already U21 caps and Premier Division experience at the age of 17 is impressive. However, he will need to improve his technical skills in order to become a first team player for us. Comment: Brought in for quite a hefty fee on his 18th birthday, having already played over 30 games in the Brazilian first and second divisions. He’s looking like a real poacher up front. Quick with nice Finishing and Composure. Lacking a bit of work rate and passing though. Made his first team debut during the season, ended up playing 11 games with an impressive 8 goals and 6 assists! 4 U20 caps (3 goals) for Brazil so far. Prediction: Impressive performances so far. If he’ll progress nicely and strengthen his weaknesses next year I think he can become a star! With a Driven personality he’ll make sure to give himself the chance. Will be getting his fair share of first team starts in 2026. Comment: We gambled a bit with this guy who we signed at age 16 two years ago, but didn’t join us until his 18th birthday. Sadly he hasn’t progressed much since age 16. Prediction: Considering the fact that he’s already 18 years old I highly doubt that he’ll ever become a first team player for us. Comment: The diamond among other gems in this season’s new Academy players! A fantastic midfielder with a glorious touch and nice passing game. Both strong and quick! Lacking a bit defensively. I couldn’t guarantee him the game time needed for his development this season, so he spent the season on loan at German First Division team Hamburg, where he made 22 appearances. 9 U20 caps for Brazil (1 goal). Prediction: With Wonderkid status the only way for him is up. Will surely find a way into our first team, perhaps as soon as this coming season. With twelve players graduating this is our biggest graduation class by far. There also appears to be quite a lot of quality in this group, with seven players with 4.5 star potential or better! Initial comments and prediction: A resolute midfielder with a nice passing game. Not the fastest player around though. Will need a lot of work on his physical attributes, but certainly has the potential to make it into our first team in a couple of seasons. Results: Has really impressed for our U19s and U21s. In 2025 he managed 14 goals, 19 assists and a 7.94 average rating in 34 games for the U19s/U21s. Played 3 games for the first team at the end of the 2025 season. 14 U21 caps for Sweden so far. Development: Decent. A lot of +1 and +2 increases and nice +3s in Dribbling, Heading, and Long Shots. Verdict: Has really been impressive on the field. Improved some physical weaknesses and is a more well-rounded midfielder now. Will be promoted to the first team squad, where he’ll be a back-up option in 2026. Hopefully he still has some improvement in him, which will be needed if he wants to stick around for the long run. Probably not gonna become good enough for the Swedish senior squad. Initial comments and prediction: A decent hard-working midfielder. Lacking both technically and mentally. Came in for a free, which means that the pressure is off. Probably won’t make it into our first team squad, but certainly has the potential to play professional football somewhere else. Result: Has been a steady presence for the U19s/U21s during his Academy career. Played 2 games for the first team at the end of the 2025 season. Development: Nice. Notable improvements are +3s in Composure, Leadership, Jumping Reach and Stamina, +4s in Dribbling and Technique and a very nice +5 in First Touch. He has also grown 5cms, now measuring 177cms. Verdict: He has really improved nicely, but he is nowhere near good enough for a spot in our first team. Since he only has a 3.5 star potential I don’t feel that it’s worth keeping him around hoping for more improvement. Therefore, he will leave the club. Hopefully he’ll have a decent career somewhere else. Initial comment and prediction: A quick right back that’ll need to work on his technical abilities, both on offense and defense. “Has the physical ability to run up and down the right wing, but will need to improve a lot to be able to do anything useful with the ball.”. Result: Made some impressive performances for our U19s/U21s during the first half of the season. Went on loan to Norwegian Premier Division team Kristiansund, where he played scored 3 goals in 11 games! Development: A couple of +1s here and there. Quite unimpressive if it wasn’t for a very successful tutoring session that provided him with a Professional personality and a +5 increase in Determination! Verdict: Has proven to be good enough for the Norwegian Premier League, which is basically one step below Allsvenskan. That, coupled with his huge increase in Determination makes me curious to see what sort of improvements he can make in 2026. Therefore, I will keep him for a 2026 season where we’ll try to loan him out to a better league than the Norwegian to see if his development can sky rocket! Result: He has played a total of 35 games for the first team since joining in 2024, with 2 goals and 5 assists to his name. 8 U20 caps for Argentina so far. Development: Close to nothing at all! +1s in three attributes, that’s it! Verdict: He has been decent for us on the pitch, but hasn’t impressed at all on the training ground. That fact combined with him trying to force a move to a “bigger club” makes me quite certain that he’ll leave the club for the highest bidder! Result: After the sale of no1 RB Karamoko, he quickly became our new first choice. With a 7.32 average rating in 44 games for us he has really impressed! Development: Not that impressive, with +1s in about half of the attributes. However, through tutoring his Determination increased by +4 and he now has a Driven personality. Verdict: Solid performances on the pitch despite his young age coupled with his excellent Determination and Teamwork makes me hope for a great career at the club. With a current 2.5 star ability and a potential of 3.5-4.5 stars there might be quite a lot of development left in him! Of course he’ll be a player for the 2026 first team! Result: Played 24 for our first team with 4 goals and 6 assists and another 9 games away on loan at Allsvenskan team Häcken. Development: Quite disappointing. Some +1s here and there and a single +2 in Bravery. Verdict: Impressed in games for us, but failed to make an impression away on loan. He is basically the same player that he was a year ago, which is pretty disappointing. This is a tough one, I’m actually not sure what to do with him. I’ll keep him in the first team discussion for the pre-season, but if he doesn’t impress me I’m not afraid to move him along. Result: Has played 8 first team games (3 for us and 5 away on loan at Allsvenskan team Elfsborg) with an average rating of 7.14. Development: Like most of the other players pretty disappointing with a couple of +1s here and there. Tutoring changed his personality from Fairly Professional to Resolute. Verdict: This is another tough one. He still isn’t good enough to take one of the two MR spots in the first team, but I don’t want to let him go yet. I’ll give him another season away on loan before I make my final decision! Result: Spent the 2025 season away on loan at Serie B team Bari, where he played 19 games. 17 U21 caps for Iceland so far. Development: Like most of the other players pretty disappointing with a couple of +1s here and there. Prediction: Not good enough for the first team. Since his potential has dropped to 3-4 stars I doubt that he’ll ever be good enough. Therefore I’m going to sell him, preferably to another Swedish team. Initial comments and prediction: Another midfielder with a nice passing game. Decent speed, but lacks some toughness. Will need a lot of work on both physical and mental attributes. “I have the feeling that he will have a decent career, but will probably never be good enough for us”. Result: Impressed enough for the U19s/U21s during the 2024 season to secure a loan deal with Allsvenskan side Gefle for the 2025 season. He played 21 games in Allsvenskan this season with a decent average rating 0f 6.89. 7 U21 caps for Sweden so far. Development: Not that great. Mostly +1s and +2s but also a couple of -1s including Determination. A nice +5 in Strength. Verdict: Looked decent coming through our youth intake in 2023 and I predicted him to have a decent career. He has already played a full season in Allsvenskan and I predict him to play many more. He might even be good enough to secure a deal abroad in the future. However, he is not good enough for us, but with a 4-5 star potential he might be in the future. I’ll give him one more season away on loan before I make up my mind, but he’ll probably leave for good then. Result: Made his debut for the first team in 2024 and has been a solid performer as a left back since then, totalling 50 games with an average rating of 7.27. 26 caps for Burkina Faso so far. Development: Decent with +1s in most attributes +2s in Decisions, Stamina and Pace and +3s in Concentration, Leadership and Positioning. Verdict: Will have a spot in the 2026 first team, mainly due to a lack of competition in the DL position. Has proven himself as a decent Allsvenskan player, but I’m hoping he can progress some more, which he’ll certainly need to stay for the long run. Initial comment and prediction: A nice 4 to 5 star potential goalkeeper! Lacking some balance and technical abilities, such as passing and first touch, but shows nice Determination! “Looks really decent for a 16 year old. Considering our lack of good keepers, he might get the chance rather soon if we get injuries to the first team keepers”. Result: He has been our back-up option for the last three years, playing a total of 42 games for the first team. 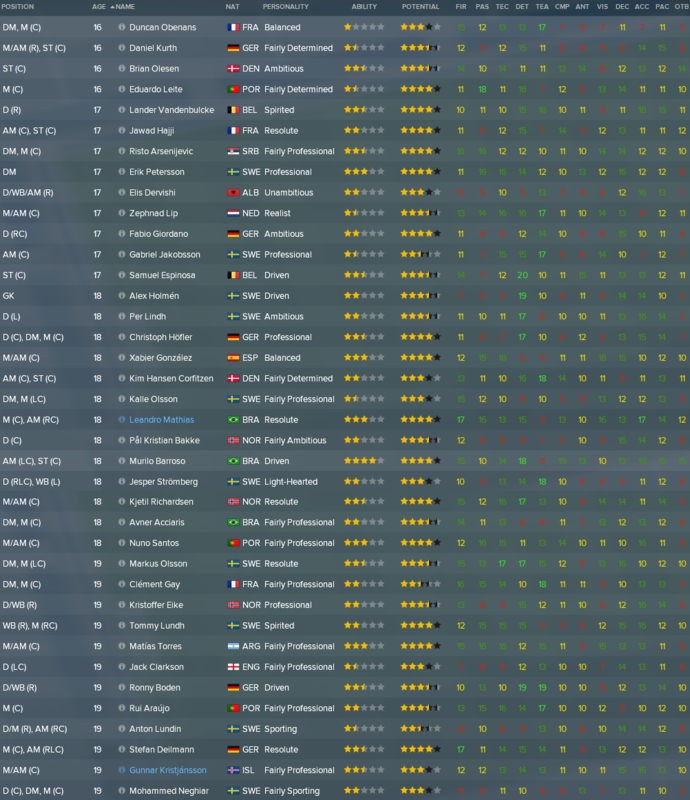 1 U21 cap so far. Development: Nice. He has improved basically every attribute with +3s in Concentration, Anticipation, Composure and Balance, +4s in One on Ones and Strength, +5s in Aerial Reach and Throwing and a +6 in Passing. He has also seen his personality change from Fairly Determined to Resolute. Verdict: He sure has developed nicely since the 2021 youth intake. We had plans of making him our no1 keeper, but a combination of decreasing potential and the acquisition of a new Uruguayan star keeper he’s going to have to settle for the no2 spot. He’ll remain in the first team squad, but will likely be moving on when he’ll start wanting steady first team football. Will surely have a long career in Allsvenskan, but I doubt that he’ll become good enough to play abroad or become a Swedish international for the Senior team. Result: Has gradually become an important player for us, totalling over 70 games for us since his debut in 2023. 3 U21 caps for Germany so far. Development: Decent. +1s or +2s in most attributes and +3s in First Touch, Penalty Taking, Concentration, Vision and Acceleration. Has also seen his personality change from Professional to Spirited. Verdict: Has gradually increased his importance for the team over the years, even though he had a better 2024 than 2025 season. He’ll remain in the first team for 2026, but needs to be looking over his shoulder for younger prospects coming through the Academy. Initial comment and prediction: Looks like a fairly quick nice little forward. Nice dribbling, finishing and heading. Severely lacking in Passing (3) though, which is something we’ll need to address in coming seasons. “He will spend the first couple of seasons in the U19s, working on improving his attacking skills (mainly passing) and physical attributes. With a 4 to 5 star potential I hope that long-term he will develop into a player for our first team”. Result: Has scored loads of goals for our U19s/U21s, but hasn’t managed to make his debut for the first team. The last two seasons have been spent at Swedish 2nd tier clubs Sirius and Helsingborg, scoring 13 goals in 32 games. Has played 14 U21 caps for Sweden with 9 goals. Development: Decent. +1s and +2s in most attributes +3s in Vision and Balance, +4 in Strength and a +6 in Passing. Has also managed to change his personality from Balanced to Fairly Professional. Verdict: He hasn’t improved enough to secure a spot in the first team squad and with his potential dropping to 3-4 stars I doubt that he ever will. Therefore I’m going to sell him, preferably to another Swedish team. However, I will continue to monitor his development along with Gear each year. Both heaven and hell. On a positive note, we’ve signed a lot of really promising youngsters and we have five new players from our Academy taking up permanent spots in our first team next season. Quite disturbing though, is the fact that our Academy players seem to have stopped progressing. I think I might have pushed them too hard in an attempt to maximize the use of our State of the art youth facilities by putting the workload of both team and individual training too high. I will reduce the amount of training for next season in an attempt to once again increase the development of our individual players. As a team the U19s have been fabulous, smashing their opponents in the Youth Champions League. I’m really looking forward to the knockout stage! Current Academy products in the first team squad: Ten (New record high!) Boden (30 games), Wahlberg (29), Kresojevic (30), Lorshag (30), Fröhling (28), Gear (20), Fechner (20), Sanou (20), Högberg (22) and Barroso (10). Here we will look at some of the former BP Academy players that have left the club and now play their football in different European clubs, big and small. Jonathan Antonsson – Wolves – Sold for €375K in 2017/18. Spent the first seasons on loan gaining experience. Since his return to Wolves in 2021 he has been getting more and more game time and at the age of 25 he has become a key player for the first team, with over 130 games in the Championship. Ludvig Johansson – Bordeaux – Sold to Monaco for €1.4M in 2018/19. Struggled at Monaco, never really impressed enough to become a first team player. Went out on loan to Premier League side Crystal Palace, where he impressed enough to secure a permanent move to Ligue 1 team Bordeaux for €3.8M in 2024. Has played over 60 games for Bordeaux since his arrival. Fredrik Hammar – Genclerbirligi – Sold to Stoke for €1.9M in 2018/19. Spent the entire time at Stoke out on loan. No games for the Stoke first team. Left for Turkish Super League side Genclerbirligi at the end of his contract in 2023, where he has started over 80 games so far! Lorenzo Venturini – Juventus – Sold for €5.5M in 2020. Played 14 games for the Juventus first team, before going out on loan to Serie B side Palermo followed by a two year loan at Mexican side (!) Santos Laguna, where he became a key player. Since returning to Juventus in 2024 he has played 50 games in the Serie A. Has played 19 caps for Italy so far and his valuation has risen to €43.5M! Hervé Aka – Fenerbahce – Sold for €3.5M in 2021. He has played regularly from the start for the Fenerbahce first team, totalling over 80 games since he left us, becoming an important player for them. Lewis Park – Juventus – Sold to Genk for €5.75M in 2022, against my will! Became an important player for the Belgian side straight away, playing regularly from the start, totalling 90 games for them, before moving to Juventus in 2024 in a €20.5M deal, becoming team mate with Venturini! He has played 25 games for Juventus since the move. Stands at an impressive 40 caps for Australia at the age of 22, already regarded as their most important player. Hugo Zetterström – Rotherham – Sold to Crystal Palace for €2.5M in 2022. Didn’t play a single game for Crystal Palace. Spent his time at the club out on loan at Malmö, Championship side Wolves, French Ligue 1 side Montpellier, Göteborg and Championship side Ipswich, before joining Championship side Rotherham on a free transfer. Lado Archvadze – Ajax – Sold to Frankfurt for €2M in 2022. Played 14 games for a struggling Frankfurt side that was relegated from the Bundesliga. After relegation he was signed by Malmö for €6M, where he impressed with enough in 2024 to secure a move to Dutch giants Ajax. Currently rated as the second most important player in Georgia. Ali Kemal Yazici – Wolfsburg – Sold for €4.1M in 2023, against my will! Niclas Berglund – Watford – Sold for €3.1M in 2023. Played 3 games for a Watford side that got relegated from the Premier League in 2023 and played an important part with 32 starts for the team that won promotion straight back to the Premier League in 2024. So far he has played over 50 games since the promotion back to the Premier League. Oscar Fredriksson – Borussia Mönchengladbach – Sold for €3M in 2023. Has played 30 league games in the three seasons since joining the club, clearly regarded as a rotation player. Litha Hlophe – Borussia Mönchengladbach – Sold for €1.9M (minimum release clause) in 2023. “Lisa Lopez with a lisp” played 24 games in his debut season in the Bundesliga before falling out of grace in the second season. Currently on loan at Spanish La Liga team Eibar where he’s playing regular football. Morten Olsen – Newcastle – Sold for €9M in 2024. Played 18 games for Premier League side Newcastle in his debut season, really struggling to adapt to the higher tempo, which was reflected by his poor 6.40 average rating. Spends this season out on loan at French Premier Division side Nantes, where he is playing slightly better. Yves Karamoko – Freiburg – Sold for €10M in 2024. He has played 33 games in the Bundesliga after his record move. Seems to have become a starter for them straight away. In the next episode we will see how the team does in the 2026 season. Will we reach the goals of our five-year plan? Will we win our fifth straight league win? Will we manage the largest upset in modern time by beating Arsenal in the Champions League? Will our Academy talents start to improve again or has the Academy lost its glory? The only way to find out is by reading the next episode! Sold some good talents. Do you add any transfer clauses when you sell them? I always include 30-50% of next sale as well, at least for players that I think is gonna go up a lot in value.